My nephew asked me to make a PlayStation 3 Cake Design for his 15th birthday. I used a large rectangle cake pan and make two layers. I froze the layers so it would be easier to carve them. Stack the two layers with frosting between. 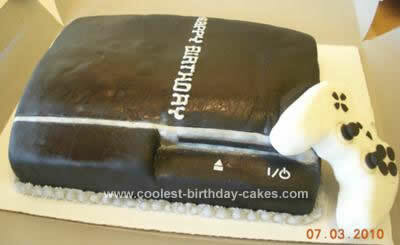 Carve the cake to the shape of a PS3. I had the actual PS3 in front of me at the time. Cover entire cake with buttercream frosting and put in fridge for at least an hour. Cover entire cake with one thin layer of black fondant. I used silver dusting powder for the silver areas, but if I had to make it again, I would use grey fondant instead. The silver dust got everywhere. I used white royal icing for the letters. For the controller, use marshmallow cereal treats and mold into shape. Cover with white fondant. Use black fondant to make the buttons on the controller. Great job! My friend’s son wants one of these and I’d have never thought to make the controller out of Rice Krispie treats. Thanks for the ideas! What did you apply to the fondant to make it shiny? Hi there, hoping to make this cake for my 13 year old tomorrow, can you please explain what krispie treats are? Pretty sure we dont have them here in Melbourne, any advise appreciated, thanks again , kind Regards Ingrid. Rice krispy treats are a combination of puffed rice cereal(Rice Krispies) and marshmallow cream. Really simple to make and taste great. You should be able to go to Kellogg’s website and find a recipe for it. Hope this helps someone.